KOOLTRONIC Water-to-Air Heat Exchangers provide uniform cooling in a closed-loop system where a reliable source of clean, cool water is available. The KPHE Series is designed primarily for use in harsh environments with cooling requirements in excess of the capabilities of Air-to-Air Heat Exchangers. They are particularly useful in highly contaminated environments that would require very frequent cleaning or changing of ambient air filters, or require frequent cleaning of the heat exchanger core. KOOLTRONIC Water-to-Air Heat Exchangers can furnish greater cooling capacities than air-to-air models, depending on water temperature and rate of flow. Ambient air is sealed out; heat transfer surfaces remain clean. The higher cooling ability of the KPHE Series depends on the temperature of the cooling water. Thus, if the water is cold enough, the temperature of the air delivered to the electronics cabinet can actually be lower than that provided by air conditioners, at less cost. 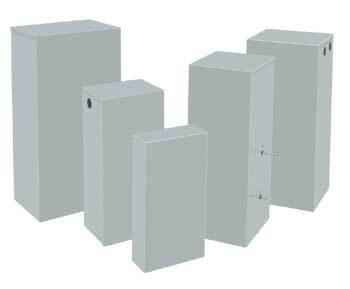 KPHE Series Heat Exchangers are available in five sizes and capacities. All models are UL/CUL Listed and meet NEMA 12 and NEMA 3R requirements. A complete range of accessories and options is available for both units, adding to their versatility. All units are fully gasketed for tight, leakproof installation, in compliance with the NEMA 12 and NEMA 3R Enclosure Ratings.